Searching for a loan? We will be glad to assist you! Give us a call at (260) 338-2561. Ready to get started? Apply Now. 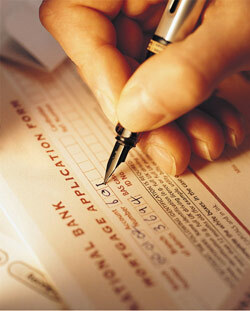 It has been said that only when your new interest will be at least 2 points lower, should you refinance your loan. That might have been valid a while back, but with the fact that refinancing has been costing less in recent years, it is a good time to explore the options of a new loan! Refinancing has various advantages that will often make it worth the initial cost many times over. You might be able to bring down your interest rate (sometimes by a lot) and reduce your monthly mortgage payment amount with your refinanced mortgage. You also might have the option of pulling out some of your home equity by "cashing out" a sum of money to fix up your home, consolidate debt, or take your family on a vacation. You might have the option to refinance into a shorter-term mortgage loan, enabling you to build up your home equity quicker. As you probably know, you'll have some fees and expenses during your the refinance process. When you refinance, you're paying for many of the same things you were charged for when you obtained your existing mortgage. Included in your costs will typically be an appraisal, underwriting fees, lender's title insurance, settlement costs, and other fees. You might think about paying points to reduce your interest rate. When you pay (on average) 3% of the mortgage loan amount at the start, the savings for the life of the refinanced mortgage loan can be substantial. We recommend that you talk to a tax professional before acting on rumors that these points paid can be deducted on your taxes. An additional expense that borrowers might take into account is that a reduced rate of interest will reduce the interest amount you will deduct on your federal income taxes. Call us at (260) 338-2561 to help you do the math. Most borrowers find that the monthly savings quickly outweigh the up-front cost of refinancing. We can help you find out your options, considering the effect a refinance may have on your taxes, how likely you might be to sell in the next couple of years, and your money on hand. Call us at (260) 338-2561 to get started. Want to know more about refinancing your home? Call us at (260) 338-2561.